Pharma-Bio Serv, Inc. (OTC:PBSV) filed their 10-K for their 2018 fiscal year ending October 31, 2018. This represents the first reporting period following the divestiture of their laboratory assets, the sale of which closed in mid-September. As we had anticipated, results indicate that shedding of the laboratory, which had been a fairly consistent drag on profitability, benefitted net income and EPS. As such and as we had opined in our initial report following news of PBSV’s plans to sell the lab, the divestiture appears to be proving to be a sensible and shareholder-friendly decision. In fact, we have made further adjustments to our model following reporting of fiscal 2018 numbers, the vast majority of which reflects downward revisions to estimated expenses. While we had previously made substantial modifications to our modeled cost of services and OpEx, reflecting what we had anticipated would be a significant reduction of fixed and other overhead-type expenses related to the lab, based on the 2018 10-K, we think that we did not go far enough (see our discussion of lab-related depreciation and amortization below). The net results of our additional updates are a slight improvement to our projected net income in each of our forecasted periods, which now extends through the year 2022. Revenue, which is now reported ex-Lab, was $17.8M in fiscal 2018, up 34% from the prior year. Both Puerto Rico and U.S. consulting, which combined account for about 93% of the company’s total revenue, were the main drivers of the topline. Puerto Rico consulting revenue increased 32% yoy while U.S. consulting revenue jumped 76%, which included 102% growth in Q4. While consulting revenue impressed, the reduction in the expense base may have been an even bigger highlight. On a continuing operations basis (i.e. excluding lab), gross margin was 32% in fiscal 2018, up 310 basis points from 2017. Meanwhile operating expenses fell 1% on an absolute basis and were down by more than 900 basis points on a percentage of revenue basis – falling from 35.0% (i.e. $4.7M/$13.3M) in fiscal 2017 to 25.8% (i.e. $4.6M/$17.8M) in 2018. Total expenses (i.e. cost of services and opex) fell from 106% of revenue in 2017 (ex-lab) to 94% in 2018 (ex-lab). Even more noteworthy, in our opinion, is that total expenses for 2017 actual results (i.e. continuing plus discontinued operations), which reflects inclusion of the lab assets, were 109% of revenue. This shows exactly what we had expected it would – that the lab did not generate enough revenue to cover its relatively high fixed cost base and that by cutting that business loose, PBSV’s profitability would immediately and significantly improve. This is a key metric and one that, given the consulting businesses’ inherent built-in margin (reflecting a largely variable cost expense structure), one that we think will continue to improve with growth in revenue. As while PBSV’s expense base is now less significantly fixed, there undoubtedly remains meaningful overhead and therefore, opportunity to further improve upon operating leverage. The combination of 34% revenue growth, widening of gross margin and flat operating expenses resulted in a $1.9M favorable change in operating income. In 2017 PBSV incurred an operating loss of $817k, which compares to operating income of $1.1M in 2018. Divestiture of the lab similarly benefitted net income and EPS. Net loss and EPS from continuing operations (i.e. ex-lab) was $778k and ($0.0337) in 2017. This compares to $1.41M and ($0.0613) in 2017 without adjusting for the lab sale. The lab divestiture also improved 2018’s bottom line, albeit more modestly than as compared to the prior year. Excluding gain on sale of the lab assets (which amounted to $2.7M), net loss and EPS were approximately $1.26M and ($0.0547) on a continuing operations basis in 2018, compared to $1.43M and ($0.0621) without adjusting for the lab sale. Cash balance was $16.0M at the close of fiscal 2018. The lab sale will bring another $2.0M in cash and $3.0M in promissory notes. PBSV used ~$1.7M of their large and growing cash balance to pay a $0.75/share dividend to shareholders of record as of the close of business on October 15th. While not specifically characterized as such, we assume, at least for now, that this is a one-time ‘special dividend’ – although also point out that the PR (filed with 8-K, Oct 4th) leaves open the possibility of future dividends as they evaluate their strategic options (“The Board will continue to evaluate the Company’s strategic plan, which might include future acquisitions, sales of business units, dividends or any combination of these opportunities while continuing our stock repurchase plan.”). Given the health of the balance sheet including sizeable cash position and coupled with our expectation that PBSV’s consulting business generates positive cash flow, we think management will be actively engaged in looking at additional ways to put their resources to work. We think that, barring finding any attractive opportunities in the near term that another dividend or cash repurchases may potentially be under consideration. As a reminder, announced in mid-August and closed on September 17th, sale of the Scienza Lab laboratory assets sheds a segment which accounted for 12% – 13% of PBSV’s total revenue over the last two years but which also struggled to cover its fixed costs. Romark Global Pharma, LLC, a pharmaceutical client of PBSV’s (per company investor presentation), bought the assets for $5M, which is payable as $2M cash ($1.75M plus the application of a previously paid deposit of $0.25M) and a $3M promissory note (tranches of $750k, $1.25M, $500k and $500k due in September 2019, September 2020, March 2019 and September 2019, respectively). Consistent with management’s historic approach towards not providing much in the way of financial or strategic guidance, sale of the lab was accompanied by only brief comments from the company….“With the completion of the sale, we move forward with our strategy to concentrate our focus and efforts on our core consulting business, and streamline our operating segments” (Victor Sanchez, PBSV CEO, 8-k filed 9/21/18). But, given disclosures in their public filings which indicated that the lab segment had consistently been less profitable (proportional to revenue contribution) than their consulting operations (in aggregate) over the last two years, anything more than just brief comments may not (necessarily) have been necessary. While opportunistic timing may have played a role, we think the decision was based around strategic initiatives aimed at accelerating revenue and income growth. While lab revenue posted strong growth from 2014 through 2016 and quickly bounced back following interruption from the hurricanes, this segment was never consistently profitable. Conversely, while consulting revenue has been on a downward trend since reaching a peak of more than $31M in 2013, it did not dip into the red until 2016. And while 2017 was marked from interruption from the hurricanes, PBSV’s quick recovery and resurgence of growth from Puerto Rico as well as the United States has resulted in rapid improvement in profitability of consulting services. PBSV employed expense-control initiatives during times of lower activity which were effective in mitigating losses/improving profitability. That, along with time and material contracts which provide a large degree of ‘margin protection’ helped to limit losses from consulting services. Unlike the consulting business, the capital-intensive nature of the lab does not lend itself to significant cost-cutting. In order to generate a profit, PBSV’s lab needed to meet a minimum revenue threshold to cover its fixed costs. These fixed costs included depreciation on capital assets and amortization – which, based on the current 10-K, appears to have been significant lab-related expenses. We know this by comparing the ‘depreciation and amortization’ lines from the cash flow statements of the 2017 10-K versus that included in the most recent (i.e. 2018) 10-K, which treats everything lab-related as a discontinued operation – and therefore aggregates its effect (revenue, expenses, taxes, etc) into a ‘loss from discontinued operations’ line item. Per the 2017 10-K (i.e. when the lab was not considered a discontinued operation), depreciation and amortization (i.e. of the entire company) was $444k in 2017, which compares to $108k when the lab is accounted for as a discontinued operation. This means that the lab assets incurred ($444k – $108k = ) $336k of depreciation and amortization in 2017, or 76% of the total in that year. The allocation in 2018 appears to be even more significant. Through the first nine months of 2018 (i.e. prior to the lab sale) depreciation and amortization expense was at an annual run-rate of approximately $608k (for the entire company). The cash flow statement in the 2018 10-K, which treats the lab as a discontinued operation, shows depreciation and amortization of just $75k. This implies annualized lab-related depreciation and amortization of ~$533, or almost 88% of the (rough calculated) total. So, given that the lab struggled to cover its fixed expenses (and, presumably, the outlook was that that would continue to be the case) and PBSV had an opportunity to sell the lab for $5M (and to an existing customer), we think it was a sensible and shareholder-friendly decision. 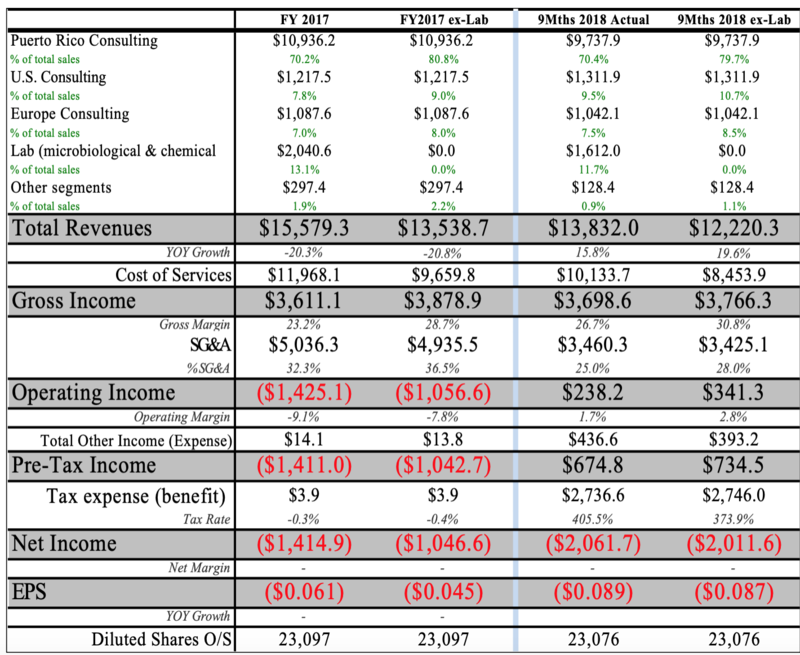 The table above is aggregated from PBSV’s filings and provides a general guide as to the profitability of the lab versus that of the consulting business prior to the announced sale. Note that the respective pre-tax income figures, as presented above, of each of the two itemized business segments (i.e. lab, consulting) does not reconcile exactly with what is implied in the pro formas (8-k filed Sept 21st and included in this report, below). For example, according to the table above (i.e. per the 10-K) FY2017 lab pre-tax loss was $649k. But, the pro formas imply that it was only $369k. We think the difference (i.e. $649k – $369k = $280k) likely represents general overhead expenses that have been allocated to the lab (but which is not specific to either business segment). If that is the case, we think much or all of this expense ($280k in FY2017) is likely to remain following the lab sale, while it is the direct-lab expenses ($368k in FY2017) that will be shed. The most obvious indicator that illustrates the relative unprofitability of the lab is the ‘net loss from operations through disposal’ line item in the income statement of the current 10-K. This shows that the lab, net of tax, negatively impacted income by $171k in 2018 while the consulting business generated operating income of $1.5M (while the $1.5M is not net of tax, if adjusted the difference is not likely to be meaningful in the context of our discussion). So, while the table above provides insight into relative profitability of consulting versus that of the lab, the pro formas may be more representative of aggregate profitability ex-lab. The tables below illustrate the benefit to margins, operating expense, net income and EPS for fiscal 2017 and the nine months ending 7/31/18. We are encouraged by the recent accelerated growth in PR and US consulting revenue, particularly given the relatively high margins and direct benefit to cash flow, income and EPS. Given that consulting at these current levels is in the black and generating cash, a substantial portion of each incremental dollar should flow through the income statement. Or model updates reflect benefit from the sale of the lab as it relates to the cost bases – specifically, significant improvement to service margin, and a moderate improvement to operating expenses, operating income and EPS. While the now even more sizeable cash balance provides that much more flexibility in terms of strategy, our model does not (yet) reflect any assumed new (i.e. inorganic) growth catalysts. That could change, however. In the meantime, share buybacks afford an opportunity to reinvest cash and do so at a very attractive valuation. We look for consulting revenue to grow at a 4-year CAGR of approximately 8% through 2022 and for EPS to grow from $0.04 in the current year to $0.13 in 2022, an implied CAGR of nearly 50%. Given that, post-lab sale, we now forecast positive net income and EPS, we are moving to a P/E valuation methodology. Given the projected steep growth rate of earnings of the company, we use a 30x multiple applied to our 2021 EPS estimate of $0.11 (i.e. $3.30/share) and discount this back to the present at 15% per year. This values PBSV shares at approximately $2.50/share. The stock currently trades at about $0.99, indicating the shares are trading cheaper than fair value. We also note that the shares trade only slightly higher than book value which, as of the close of fiscal 2018 (i.e October31, 2018) was $20.3M. As of today, PBSV trades at a market cap of $22.8M. We continue to think book value should provide a floor on the stock. And, with expectations that PBSV generates positive cash flow, we think there is good reason to believe that book value should grow.